A detailed view of the algorithm with a schematic legend is available under the Resources tab. As presented at the 2018 CUA 73rd annual meeting (publication pending). 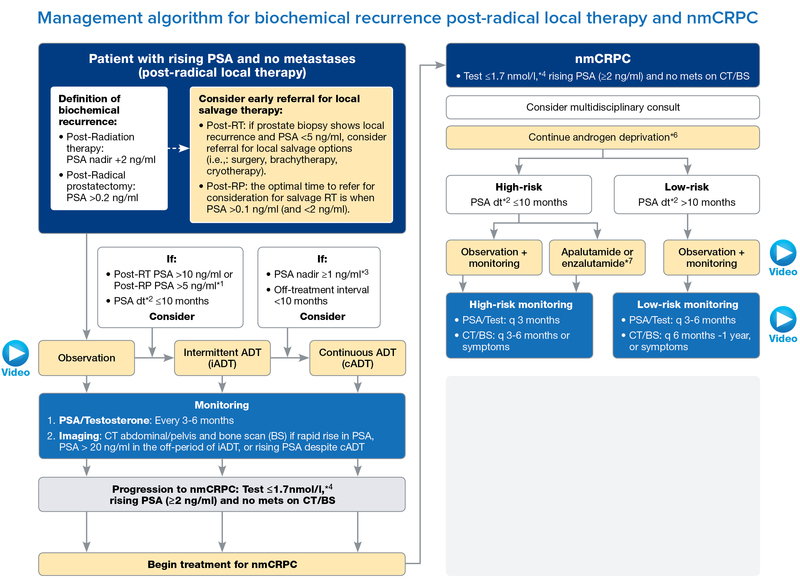 This algorithm is intended to guide therapy by highlighting commonly selected treatment sequences. It is inspired by clinical evidence, but based primarily on clinical opinion stemming from discussion among multi-disciplinary experts. As it does not represent all available treatment options or reflect all available evidence, it should not be considered definitive or replace evidence-based clinical guidelines or consensus statements. As individual patient needs are the primary consideration in therapeutic strategy, clinicians should consider suggested treatment options or clinical trial enrolment in light of disease characteristics and history, patient preference, available evidence and, ideally, in the context of a multi-disciplinary discussion. Support for development of this program was provided by Janssen Inc. The opinions expressed are those of the authors and do not necessarily reflect the opinions of Janssen Inc. or STA Communications. It is recommended that physicians evaluate their patient’s individual conditions before making a diagnosis or treatment decision. Any products mentioned herein should be used in accordance with the prescribing information contained in their respective product monographs. The content on this site is intended for health professionals. Copyright 2018 STA Communications Inc. All rights reserved. Content on this site may not be reproduced without explicit consent from the sponsor and STA Communications Inc.